Perfectly Created Chaos! 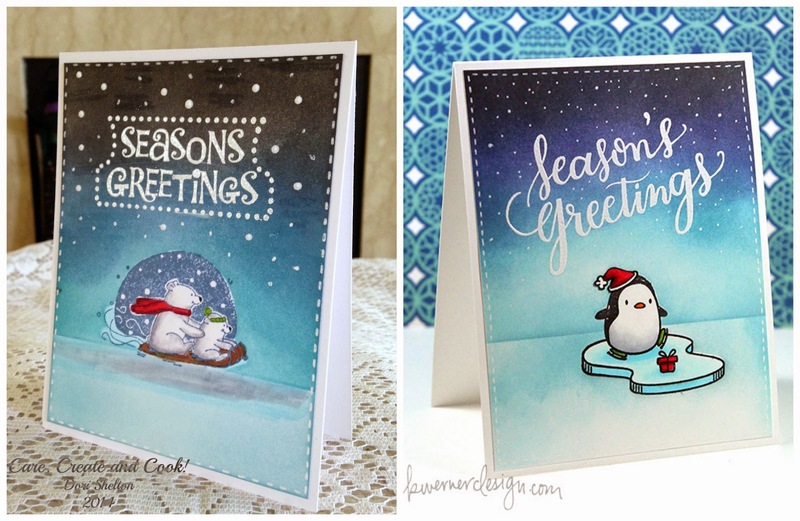 : 25 Days of Christmas cards: Day 5 "Arctic Season's Greetings"
25 Days of Christmas cards: Day 5 "Arctic Season's Greetings"
Welcome back for Day 5 of "25 Days of Christmas cards." If you are just joining me, let me fill you in a bit about what's going on at the blog these days. I am doing a series of 25 Christmas Cards inspired by Kristina Werner's Holiday Card Series. Each day, I post my interpretation of Kristina's card and then a side by side of mine and hers. For Day 5, I used a set from Inkadinkado called "Christmas Characters" because it was what I had on hand that most closely matched the image Kristina used. One thing I have learned in making these cards this year is that I really really really need to get some masking paper! Masking the polar bear image was a little difficult and if you look at this card very closely in real life, you can see where I missed a few spots. I'm not the best at copic coloring either....I need to get some lighter colored grey copics for "coloring" white areas; but again...you do the best you can, right?! I created the background with Tumbled Glass, Broken China, Faded Jeans, and Black Soot distress inks and then added some shading with copics under the image to "ground" the sled. The sentiment is from a set I bought at Michael's a few years ago and have used surprisingly a lot! I embossed it with white embossing powder. I added some white studio paint "Blank Canvas" for the snowflakes/stars in the sky. I was quite pleased with the final result! I adhered the image panel to a standard sized card on 110lb Neenah solar white card stock. Here are the two cards side by side for you to see. Not too shabby if I do say so myself! Once again, thanks for visiting me today, I'll see you tomorrow for Day 6! Such beautiful cards Dori, the images are adorable! Thanks so much for sharing in my Monday Morning Challenge! Lovely Christmas card.. Thank you for joining us at Incy Wincy. 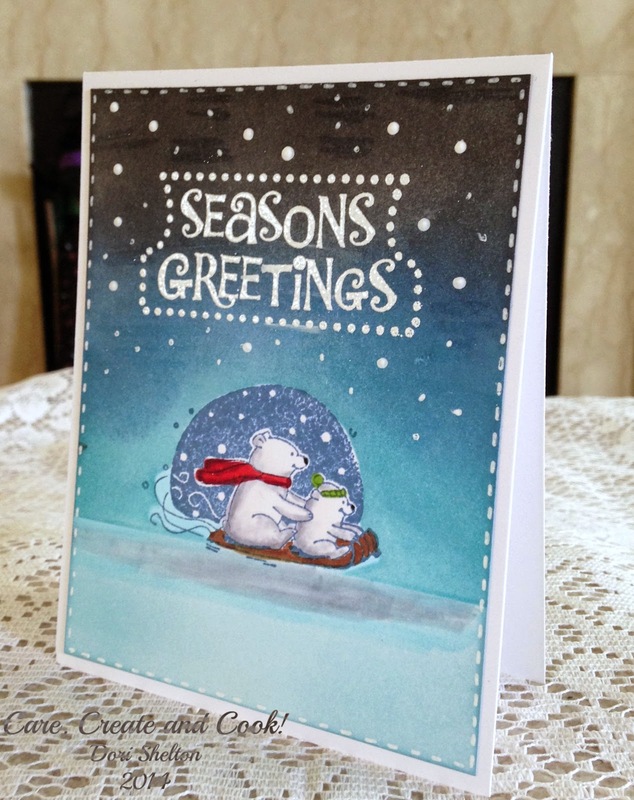 What a fab take on Kristina's card! (I am such a fangirl of hers!!) I love your cute image, so sweet! Dori, these are just too darn cute and so so sweet. I love your frosty critters flying by in what looks like a snow globe, so much fun. Thank you so much for playing along with us at the Get Creative Challenge.